Remember when the only sugar substitute available was saccharin? Those pink packets of Sweet ‘n’ Low were on every diner table…your only choice other than sugar…and the sweet ingredient in the world’s first diet soda: TAB. It was a long time before another sweetener came along, and in the beginning, we all thought Nutrasweet was the answer to our prayers. Sales of Nutrasweet skyrocketed, and one of the most interesting facts to come out of that time was that despite Nutrasweet’s amazing sales, sales of sugar remained steady. People were buying Nutrasweet to make things even sweeter, without the guilt of sugar! Equal is the brand name for Nutrasweet, the artificial sweetener that contains aspartame. Aspartame can cause seizures in some people, namely phenylketonurics, and they’re being told to avoid it. It also has an overly-sweet unnatural taste. Enter Splenda, the brand name for sucralose, in the yellow packets. Sucralose is a sugar alcohol. It does not affect your blood sugar and it has no calories. But sucralose is not a natural product: it’s a total guys-in-white-lab-coats creation. Almost no aftertaste, but now there are claims that Splenda alters and even kills important flora in your gut. OK, so how about that cute little Stevia leaf? 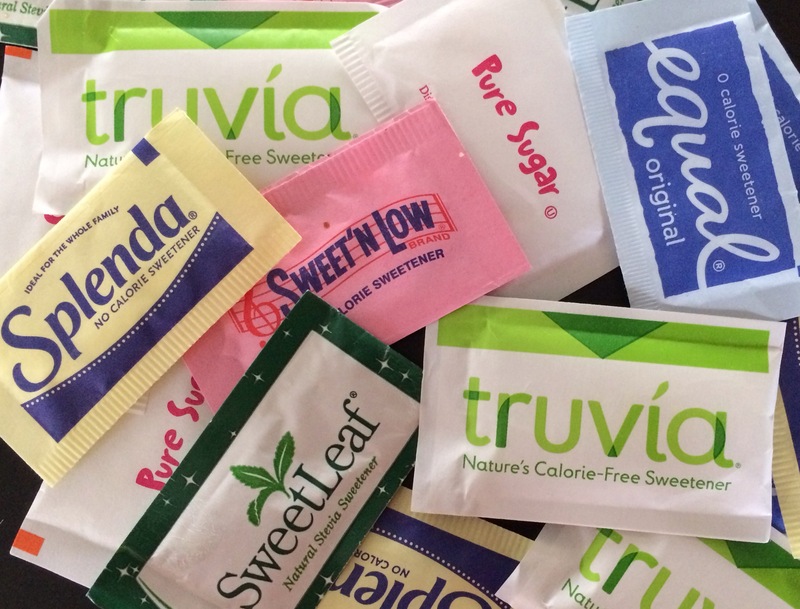 The sweetener in the Stevia leaf is natural, and marketing makes it seem like it’s the only ingredient in products like Truvia. But the fact is that the Stevia extract is extremely potent, so they use a very small amount of it. So to “bulk it up,” they add erythritol, which is another sugar alcohol. The only good thing about this is that erythritol is indeed naturally occurring, so Truvia can rightly claim to be a “natural” sweetener. Sweetleaf, besides being a song by Black Sabbath, is another all-natural sweetener that combines the extract of the Stevia leaf with a soluble vegetable fiber called inulin. Sweetleaf has zero calories and does not affect blood sugar. But the inulin left a real nasty aftertaste that had me throwing a boxful of packets into the trash after one sip. Sugar itself is not evil, and most people who watch what they eat can probably use it. But if you’re diabetic…or if you guzzle sodas, juices, and sports drinks…and eat packaged and processed foods that have tons of hidden sugar (aka high fructose corn syrup)…a sugar substitute may be a good move.